Bettie skirts are vintage pinup gone goth all the way! The long row of buttons emphasizes the luscious curve of the tight pencil skirt, drawing attention to the stunning silhouette it creates. 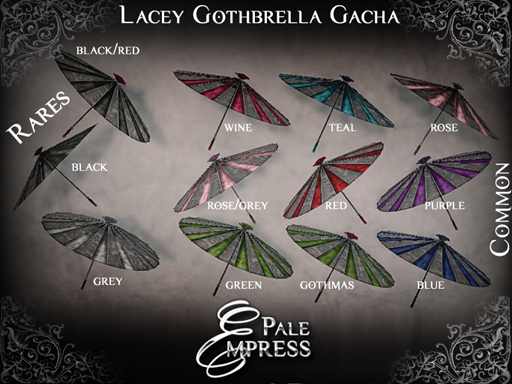 The luxurious fabrics add additional touch of class to the look and the strong gem tones celebrate the goth styling. These skirts can be dressed up to official occasions, but they can also be a part of your uncompromising everyday style. 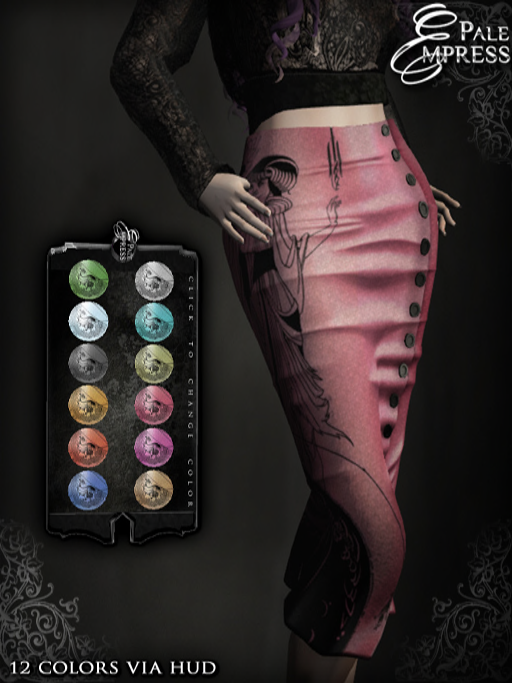 The skirts are available in four different patterns and there’s a colour-change HUD of twelve colours included with each skirt, so you are actually getting a full pack of skirts at the price of one! The skirts are rigged mesh and move with your avatar. They come in the five standard sizes plus a fitmesh size. Please try the demo before purchasing. 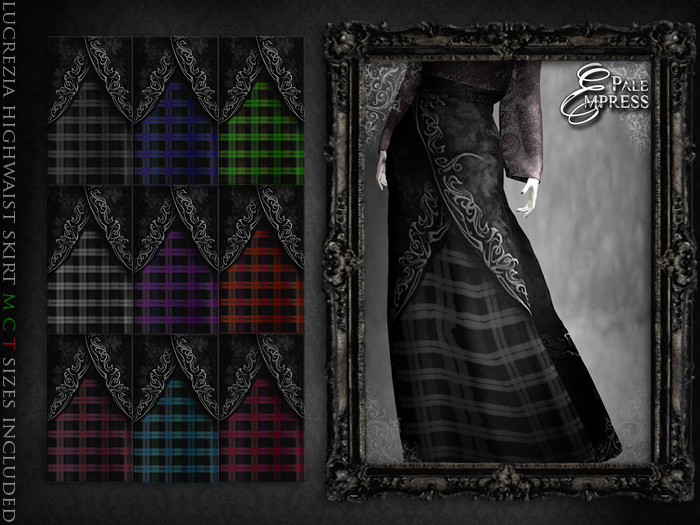 The Severina set originally released for World Goth Fair 2014 has now been updated into collections of all colours: some with HUD for colour change, some to include all the corresponding colours. 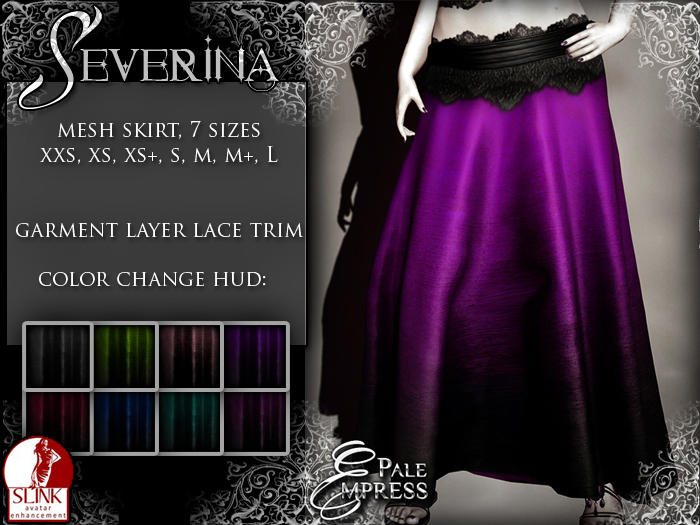 Severina is covered in lace and jewels, polished from the tip of her toes to the jewels adorning her neck. 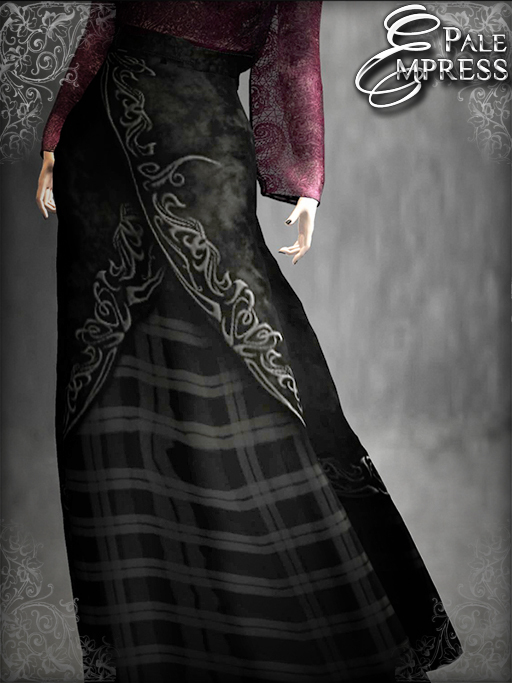 The long skirt combined with the lace adds a romantic, almost historical gothic drama to the look, making it also appeal to roleplayers. This is the look for the women who know the true meaning of drama and live the intense passion daily. 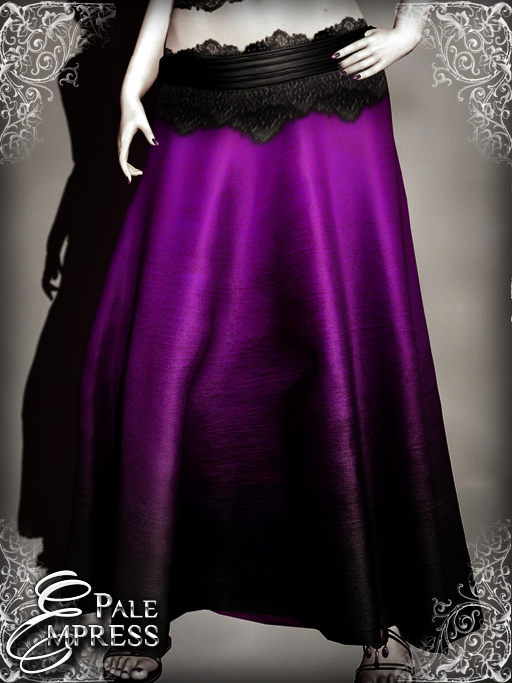 The maxi skirt is rigged mesh with an additional garment layer lace for the upper trim. It comes with a colour change HUD of eight colours. In addition to the five standard sizes there are also two additional ones: XS+ that provides more generous curves in the top part of base XS and M+ that has more muscles and extra curves than base M.
The sleeves are rigged mesh with two garment layer lace trims (undershirt and gloves) and Slink hand tattoo applier option for the lower. 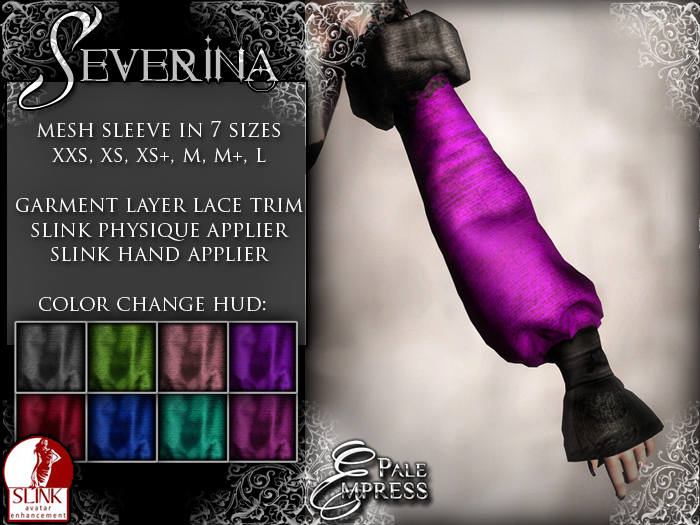 The sleeves also come with Slink Physique applier. The sleeves come with a colour change HUD of eight colours. In addition to the five standard sizes there are also two additional ones: XS+ that provides more generous curves in the top part of base XS and M+ that has more muscles and extra curves than base M. Slink hands or physique are not included. The Medallion Jewelry includes two pieces: an unrigged mesh collar with lace covered insets. There’s a large medallion with drop beads on front and buckles at the back of the collar. A garment layer lace trim is included on the jacket layer. Also included is the medallion on a simple chain, hanging at midchest length. The pack includes eight colours. The sandals are unrigged mesh designed for Slink natural barefeet and include a stunning cabochon effect Slink nail appliers for both hands and feet. There’s eight colours in the pack. Slink feet and hands are not included. Permissions are M/C/NT. Price L395 per pack.